PRODUCT: MODEL AB255, SELF CONTAINED GABLE MOUNTED SOLAR POWERED ATTIC VENTILATOR FAN KIT, WTTH REMOTE MOUNT SOLAR PANEL, 1550 CFM, 25 WATT WITH THERMOSTAT. UNPAINTED, GALVALUME FINISH. LIFETIME WARRANTY. PRICE/KIT. 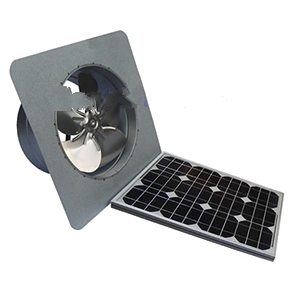 DESCRIPTION: The Attic Breeze solar powered attic fan is the most powerful fan available. It vents up to 1550 CFM and can efficiently ventilate an attic space of up to 2200 sqft. Unit is designed to mount behind an existing gable vent. The AB255 is constructed of heavy duty components that include a 25 Watt photovoltaic module, all steel heavy-duty base and shroud cover, 28V D.C. fan motor, 14 inch 5-blade assembly and rodent guard / bug screen. Remote mount solar panel includes 15 feet of shielded wiring and low profile flush mounting brackets. Solar Panel: high efficiency monocrystalline solar cells. Material: 24 gauge zincalume; unpainted. AIR INTAKE REQUIREMENTS: The manufacturer recommends 1600 Sq. Inches intake for optimum performance. Adjustable Solar Panel universal mounting bracket option. Allows mounting remote solar panel. Fits 10-25W panels used on Attic Breeze models and others. Price/Bracket.